Ukrainian Computer history. "Dnepr" computer at the space operational control centre. 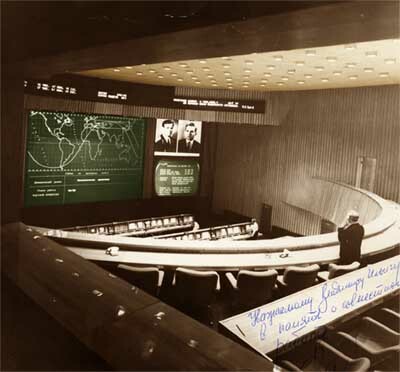 Two computers "Dnepr" complex (behind the screen) in the Center For the Space Flights Control. The information from the 150 sensors comes to the complex and is displayed as the satellite (space ship) trajectory on the screen. The sign on the photo says: "To the reverend Vladimir Skurikhin for the remembrance about joint work, 1974"